When R. Stevie Moore achieved underground notoriety in the 1970s, he was hailed as a do-it-yourself pioneer. DIY was a rogue subgenre of independent music in which artists assert maximum control over the creative process. was a one-man music factory. Despite occasional collaborators and sidemen, he was too self-centric to be a team player. The outcome was (and remains) critical acclaim, but limited commercial splash. Not for lack of effort on the part of Mr. Moore. His output slowed with age, but he continues recording because that's his raison d'etre. is an idiosyncratic pop gem. For RSM, perhaps there's life after obscurity. administered outside North America by Basta Music except "Another Day Slips Away"
Thanks to: All of the above. And none below. pop music is the start. You're so rotten, don't you know? Tell me what do I do with the rest of my life? Tell me how is it possible? How is it done? Tell me how do I deal with this rust on my knife? Smart as you, take back. You think I got all day? For most artists, re-recording material from their back catalog is a sure sign they've either run out of ideas or they're trying to generate new paychecks from old work. But even the most churlish observer would give R. Stevie Moore a pass on such things, since only a tiny cult has ever heard the majority of the voluminous body of home-brewed recordings he's been issuing at a steady stream since 1975. 2019's Afterlife finds Moore cutting new versions of 14 of his favorite compositions, though the liner notes stress that these performances were "(r)ecorded in the 21st century in real recording studios." Moore was an early adopter of recording music at home using a makeshift studio, yet he's had enough experience in professional recording environments that they don't stifle his musical thinking. 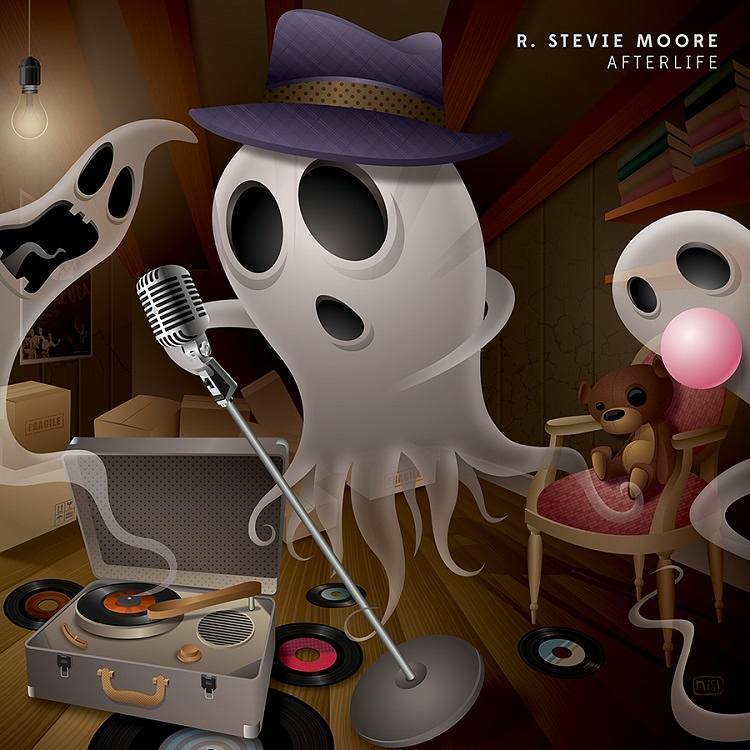 As a consequence, the tunes on Afterlife have much of the same playful, anything-goes pure-pop charm of Moore's endless supply of lo-fi home recordings, but with improved fidelity and production that makes the most of his gift for crafting delicious if slightly eccentric pop melodies. While six of these tracks were recorded with Moore handling all instruments and vocals, most feature him working with other musicians for a change, and if this gives the music a slightly different character, it doesn't dilute the essential spirit of his music, and lends the recordings a slightly more organic feel. And since very few people will be familiar with all (or even any) of this material, Afterlife actually serves as a dandy introduction to R. Stevie Moore's work, boasting a fistful of great tunes, plenty of cool guitar work, an abundance of humor and philosophy, and a singular take on rock and pop that's surprisingly accessible given Moore's eagerness to experiment and bend the rules. For longtime fans, Afterlife shows that R. Stevie Moore can clean up and play nice and still hold tight to the qualities that have made him a cult hero, and for beginners, this is a slightly refined but still accurate introduction to an artist who is some sort of national treasure. In short, who doesn't need this album in their collection? R. Stevie Moore was a pioneering home recording artist, whose prolific output was revered by the tastemakers of punk and new wave throughout the ’70s and ’80s. Legend has it that he has released over 400 albums, mostly on cassettes, with limited distribution. His willful and craggy approach to DIY pop has earned him a good deal of respect and adoration from similarly minded artists like Ariel Pink. Unfortunately, this fame does not come hand in hand with fortune. Afterlife is a compilation of professionally re-recorded compositions sourced from various reference points in Moore’s humble career, with a handful of original sprinkled in for good measure. It’s a self-conscious effort to reignite interest in his back catalog and current (mostly) obscure output. As an album, it’s not particularly remarkable, but as a tasting menu of Moore’s various moods, preoccupations, and stylistic quirks, it is exceptional. 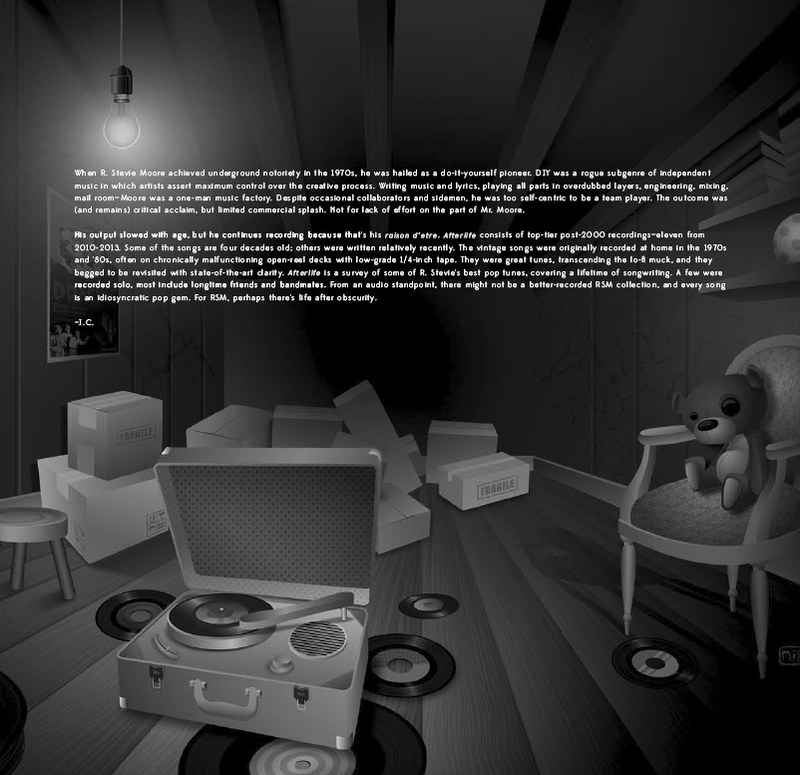 Afterlife is an opportunity to nibble on a bevy of samples, discover different flavors, and then to track these ingredients back to their sources in a fun and rewarding musical truffle hunt of sorts. The most exciting morsel for me is the woozy, rubber-band guitar-pop and middle-eastern flavored “What Do I Do With the Rest of My Life?” The entire collection is overflowing with weird, irrepressible energy, full of bizarre, crude gems that will hopefully inspire some crate spelunking in your near future. Moore has stated in interviews that he will not tour in support of Afterlife which is a darned shame.